As a new mom, there never seems to be enough time in the day. Time stands still when you’re trying to put the baby to sleep. 10 minutes feels like 10 hours. Then there are some days where I wake up, and the next thing I know it’s 5:00! So basic things that I need to do like, I don’t know, cleaning the house, making dinner and well showering, become an afterthought. That’s why I’m always looking for ways to save time and make life easier. Which brings me to my latest venture-one pot wonders i.e. 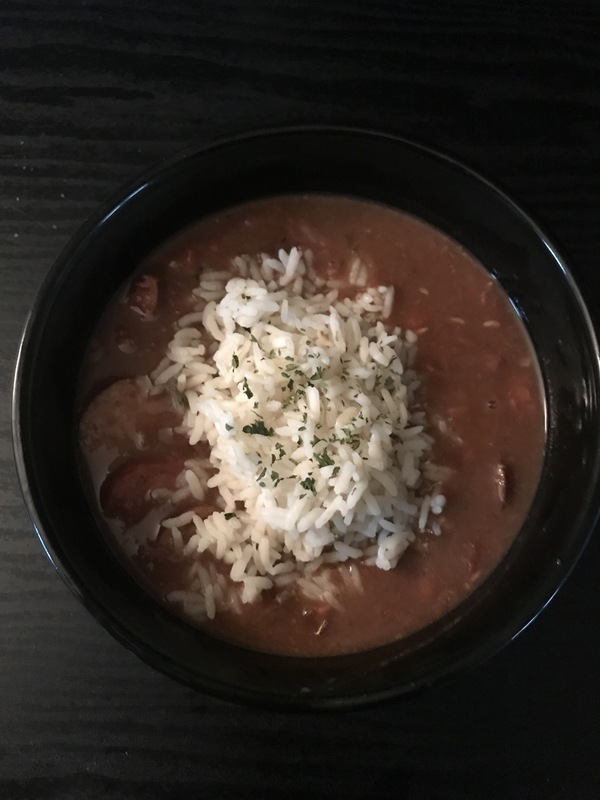 red beans and rice. 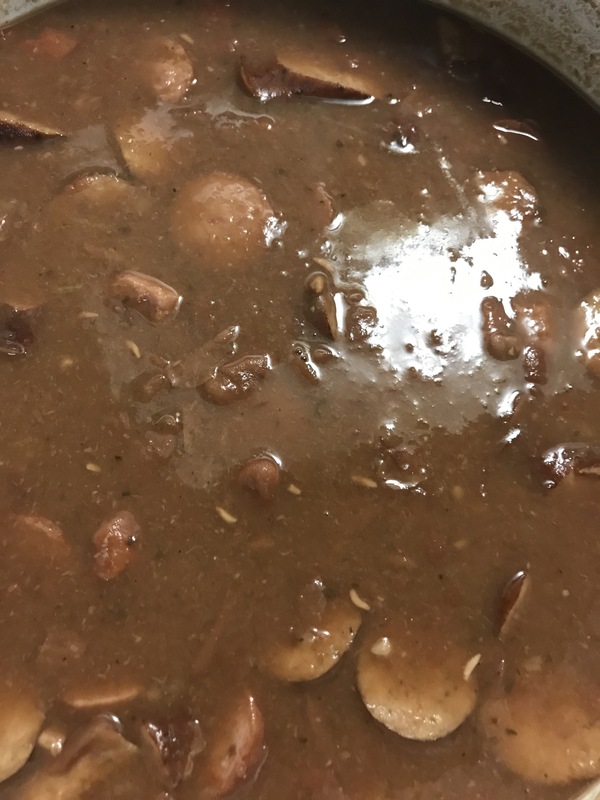 You may be thinking 💭 hmmmm…a blog post about red beans? Don’t knock an oldie but goodie. I totally understand why it’s a recipe that’s passed down from generation to generation. It’s easy, it’s filling and it’s a perfect leftover meal. And when you’re short on time, but still need to make dinner, this has become my favorite (and my husband’s favorite) weekly meal. The hardest part I’ve found about being a new first time mom is trying to meet your own unrealistic expectations. I had so many pre-conceived notions about motherhood and none of them turned out to be true. This has forced me to prioritize my routine and just do what I can when I can. You don’t have to clean the whole house everyday and make a 4 course dinner all while trying to run after your crawling baby. Make a meal that gives you leftovers, clean one room of the house when the baby naps and well, you still have to run after the crawling baby, but at least you’ll be prepared for it. So the cooking process is basically an all day affair, so be prepared for that. First, I soak the beans over night and the next day I rinse them until the water runs clear. Then I fill the pot with water and start it to boil on medium heat. Keep and eye on this because you do not want to burn your beans or you will have to start all over which defeats the whole purpose! Next, I blend maybe a cup to a cup and a half of the creole seasoning in my food processor. Then I add it to the pot with the beans and let the seasoning incorporate in with the beans as they boil. After the beans cook down a little, I add more water and keep cooking them. I fill up the pot maybe 2 times before I add the meat. In a skillet, I add more creole seasoning and enough water to fill the bottom of the pan. I use water instead of oil or butter so that I don’t have to drain it before putting it in the pot with the beans. I let the seasoning and water cook down a little before adding all my chopped up sausage. Then I season my meat with whatever spices I want and when it’s done, I add it to my beans. I use turkey sausage and chicken sausage but most people flavor their beans with ham and pork sausage. The good thing is you can use whatever you want, but I usually opt for the healthier option since I don’t eat pork. Completely up to you. Now all you have to do is keep cooking it until it gets to the thickness that you like. Red beans cook pretty fast so you don’t have to keep adding water if it looks like it might be done. Taste your beans often and make sure it’s got the flavor you want and the consistency you want. And then, voila! Add rice if you want. I use the boil in a bag instant rice and you just follow the box directions on that. It’s pretty much idiot proof. You now have a meal for the next few days. So when your husband comes home and asks what’s for dinner, you don’t have to punch him in the face. Tell him dinner is done and leave you alone. He knows how to use a microwave, right?! What kinds of meals do you make? I’m always up for a new recipe!